We would like to thank everyone who stopped by our booth! We would also like to thank the Festival Staff for all their help and for running such a great event! 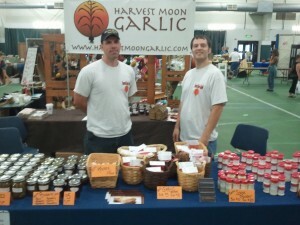 This was our first year as vendors at the Minnesota Garlic Festival. We had a great time and hope to continue attending every year. Products we had for sale; garlic, garlic powder, scape powder, pickled garlic scapes. In the future we hope to expand our line of gourmet products. If you did not have the chance to attend the Garlic Festival this year we hope you can make it next year!